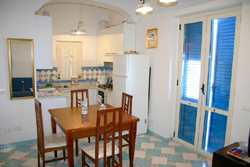 Home Marina Grande is a charming apartment located in Marina Grande (Sorrento) along the seafront of the beach.. This home is situated in a quiet area, in a typical ancient fishermen's Village, but at the same time close to the centre of Sorrento. Home Marina Grande is in an ancient building facing the ocean - which is less than 20 m away- but it has been just renewed and it is equipped with air-conditioning. On the west-side of Marina Grande (on the left when facing the ocean), one can find a nice small sandy beach where umbrellas, deckchairs and a bar are available and where kids can safely swim. Home Marina Grande is near a lot of shops: a supermarket, a greengrocers, a confectioners, a butchers, some restaurants, etc. On reaching the Marina Grande Home by car, 500 away from of the apartment there are car parking spaces. To reach the Marina Grande Home, one has to walk along an ancient narrow street, typical in our area during the XVIII and XIX centuries, and then pass through an ancient Greek Gate to reach Marina Grande where Marina Grande Home is located. 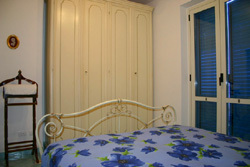 Otherwise, one can reach the apartment by following the carriage road which takes to Marina Grande. Sorrento town lies on layers of solidified volcanic ashes, 50 meters above the sea-level and there arent many beaches. That is the reason why there are so many wooden bathing piers here. If Your are looking for a rocky beach, one can go to Tonnarella beach (300 meters away from "Marina Grande Home). A curiosity: on renting the "Marina Grande" Home, consider also that, every year, on the 26th July an ancient fair dedicated to SantAnna - the patron saint of the Beach - is organised. 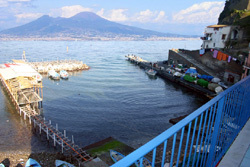 We suggest, also to stroll in the evening along the Marina Grande centre to enjoy that ancient, romantic atmosphere of this fishermens village from where one can admire the beautiful gulf of Naples with its symbol Vesuvius. And in the evening, for one of the best pizzas in the area, "Zi Ntonio a Mare" Restaurant (200 m. from the house). In addition, if You like eating fish without spending a fortune, Emilia Restaurant with its typical check pattern tablecloth. 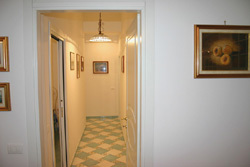 Marina Grande Home lies on the third floor of an ancient building (without lift). 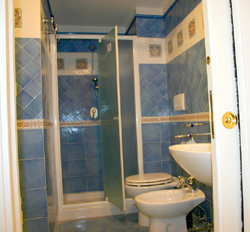 It is three-roomed lodging of 75 m 2, sleeps 4+2, composed of: wide living-room with sofa-bed (TV) dining-table, kitchen with breakfast counter (fridge, oven, washing-machine), a double room with sea-view, a bathroom with shower, another double room, another bathroom with shower, a terrace lighted from where You can enjoy a stunning 180 sea-view with Naples, Pozzuoli and Vesuvius. But the magic moment, in that apartment, is certainly the sunset: when the sky becomes redder and redder and the sea in front of the flat becomes darker and darker. "Marina Grande" Home is a great place for those who love enjoying nature, sun and for those willing to immerse themselves into a typical Italian archaic world. 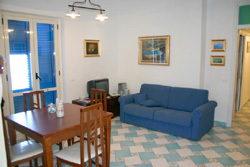 Tv - Air conditioning - Central Heating - oven -washingmachine- Shops, Bar, Supermarket and Restaurants 100 m. away- Pay car parking at 500 m. - Train Station at roughly 1 km - Banks and Post Office are at 700 m - Private and public beaches are 50 m. away - Sorrento center at 700 m.